Chicago police have successfully put a dent in what was a soaring murder rate in 2012 by flooding problem areas with officers and an overtime bill that topped $90 million this year. But what if a police department could fight crime with existing manpower by knowing where crimes are going to happen before they happen? Science fiction, or fact? To a company called PredPol in Los Angeles, it is very much a reality. The company's computer systems generate maps with tiny red boxes which they say are the most likely locations where crimes are about to occur. "The box is saying, 'Here's a location where the risk of crime is greater today, than any place else on the landscape,'" explained UCLA professor Jeff Brantingham, one of PredPol's founders. "You can spend five minutes here and have a better chance of disrupting crime than being anywhere else, even if there's other places that had crimes yesterday or the day before." Indeed, PredPol's researchers say they have found that hitting spots where crime occurred a day earlier may not be the wisest strategy. PredPol crunches 10 years of crime data and current statistics, which may have been generated in the preceding few hours, to generate its own predictions of the exact locations where police are most needed. And those boxes are small: just 500 feet square. That's about the size of a single apartment complex, or a shopping center parking lot. "It's ok to be skeptical," Brantingham says, "because predictive policing sounds like it doesn't work." But PredPol's researchers, and in fact, its users, say it does work. It uses a complicated algorithm originally written to predict earthquakes to make the deployment of patrol officers as precise as possible. "This is straight out mathematics," says Los Angeles Captain Sean Malinowksi, who helped develop PredPol and helmed a six month pilot program in the Foothill District on L.A.'s northeast side. "We had a 25 percent decrease in burglary for that six months, versus that same six months a year ago," Malinowski said. "And overall, we had a 12 percent reduction in the targeted crimes." Not only does PredPol sound like something out of the movies, it also goes against the traditional law enforcement methods of keeping score. And Malinowski said that means a change in the expectations of officers on the street. "While your whole career you've been credited for big arrests," Malinowski notes, "we'd like you to turn that a little bit on its head and prevent the crime from occurring in the first place." "The outcome for us is lower crime, not number of arrests made," he said. Right now, Los Angeles is only using PredPol for property crimes. It has recently been rolled out in Seattle and Atlanta as well. 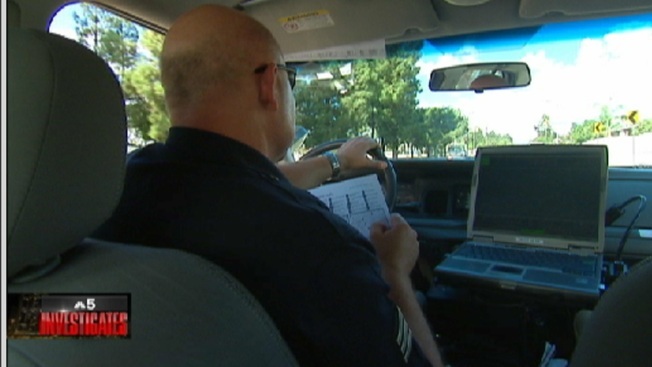 But the program's creators say they believe it can be just as effective in predicting violent crimes, including murder. "Surprisingly enough, gun crime is just as predictable as property crimes," Brantingham says. Chicago is not a client. But PredPol's founders ran Chicago crime data as an exercise. Thousands of pieces of information on gun seizures, assaults, batteries, robberies, and murders were fed in. And they say the results were impressive. Using PredPol boxes covering about 10 percent of the city, the program accurately predicted more than half of the murders which actually occurred. The researchers concede that's a high coverage area. By contrast, Los Angeles only generates about 20 of the tiny boxes per district. Still, Brantingham says the seeming randomness of a passion-driven crime like murder can be predicted. "Even though it seems to be random to the victims, it's not random at all," he says. "You can still predict two to two-and-a-half times more gun crime using this than what you would be able to do with existing practice." Closer to home, police in suburban Elgin have been using PredPol, mostly for property crimes, since the first of the year. A spokesman said the department has not yet quantified numbers on its performance. But in Los Angeles, what was a pilot program has now been rolled out citywide. "When you drive a black and white through a PredPol box, you can assume that you are likely seeing the bad guy," says L.A. Captain John Romero. "And the bad guy is seeing you." A Chicago Police Department spokesman said while they are not using the technology, they do employ other methods to try to stay ahead of violent crimes. "We are engaged in several predictive efforts, including two funded through the National Institute of Justice," said spokesman Adam Collins. "It's a predictive analytic data set that tells us who is most likely to be involved in a violent crime, either as a victim or offender, based on their criminal history and their criminal network." "We use this list to make those individuals aware of their significantly higher likelihood of being involved in violence," he said. "Make them aware of the fact that they are eligible for enhanced penalties due to their background, and also work to help get them out of a life of violence."